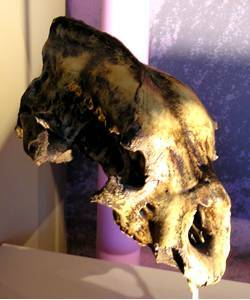 Giant Short Faced Bear facts and images. The Giant Short Faced Bear is possibly the largest bear to have ever lived. This hunter/scavenger is one of the most powerful and largest Ice Age land predators in North America. The Giant Short-Faced Bear was built for speed with it's elongated legs, and feet facing forward it could run great distances. With over 100 fossil locations discovered in North America, it ranged from Alaska to Mexico and from the Pacific coast to the Atlantic coast, including Florida. This bear lived from the Middle Irvingtonian to Rancholabrean, about 800,000 Years ago and becoming extinct around 12,500 Years ago. Standing on all four legs it had a height of 5.5 feet (1.7M), but standing on its back legs it was 11.5 feet (4M) tall. This Monster Apex Predator was about 20% bigger, but lighter built than the modern Grizzly or Brown Bear. Arctodus simus had an estimated weight of 2000-2500 lbs. (1000kg) and 10 feet (3M) in length. This Ice Age Monster had powerful upper body strength with long reaching arms. And with 8 inch long massive claws it could reach out and deliver a very deep and penetrating slash. The skull was broad and resembled that of a lion skull. It had a short snout with large nasal openings to supply large quantities of oxygen for running. 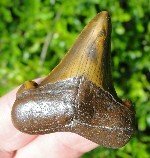 The teeth are large and higher crowned than its modern relatives. It is estimated that this top predator had a bite force of 2000 lbs. per square inch. The Giant Bear had a hunting range of over 200 square miles. There are three early established genera of bears in North America, the Late Miocene Plionarctos, the Late Pliocene Tremarctos and the Early Pleistocene Arctodus. The only living sub-family of Tremarctos is Tremarctos ornatus (Spectacled Bear) of South America.